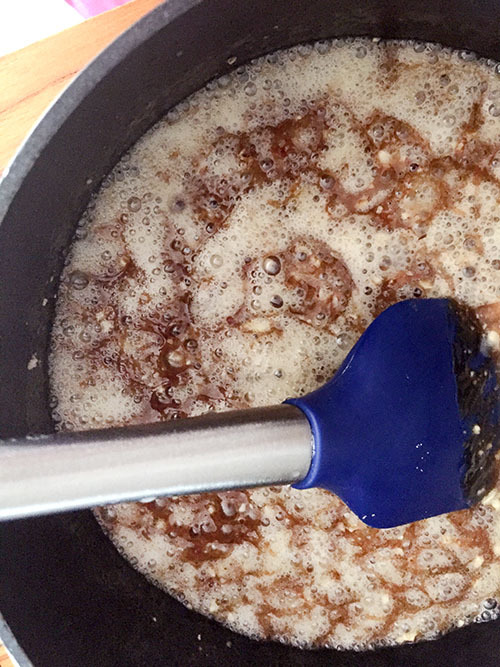 I was but a wee lass when I started making toffee. My sister, about five years older than I, was in her early days of home ec class (do kids still take home ec class?) and came home one day with some stapled sheets filled with all sorts of candy recipes on them — hard candy, divinity, fudge and other treats, like some coconut-and-almond “strawberries” flavored with Jell-O (her favorite). 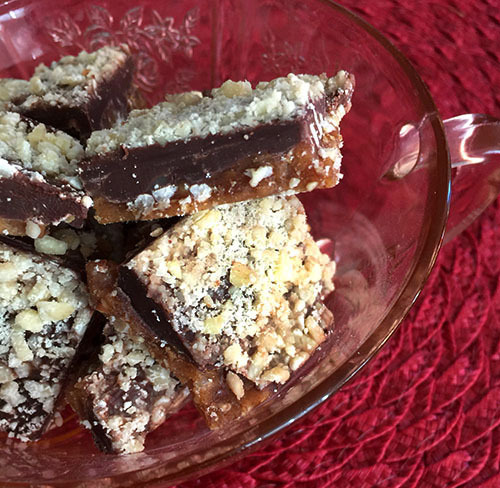 There was also a simple recipe for toffee, a butter and sugar concoction that was cooked on the stove, poured into a buttered pan, and topped — while warm — with chocolate chips that were spread once melted to “frost” the candy, then the surface was sprinkled with chopped nuts. 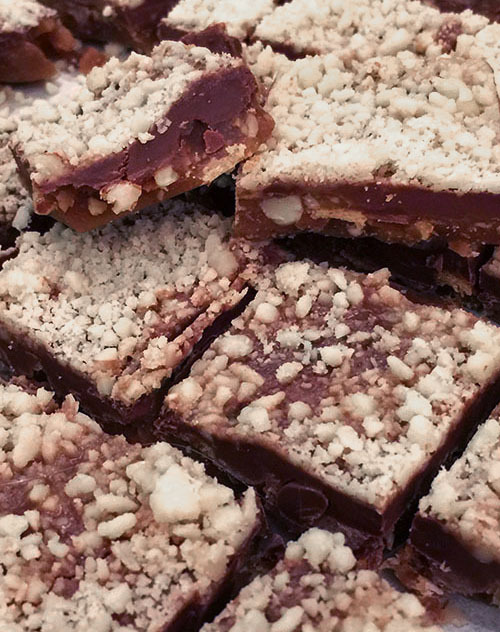 I don’t think I was even in my teens (or barely in them) when I began whipping up this toffee recipe…it became an early specialty. The family loved it (my dad had a fondness for Heath bars), and I gave it out as gifts, too. 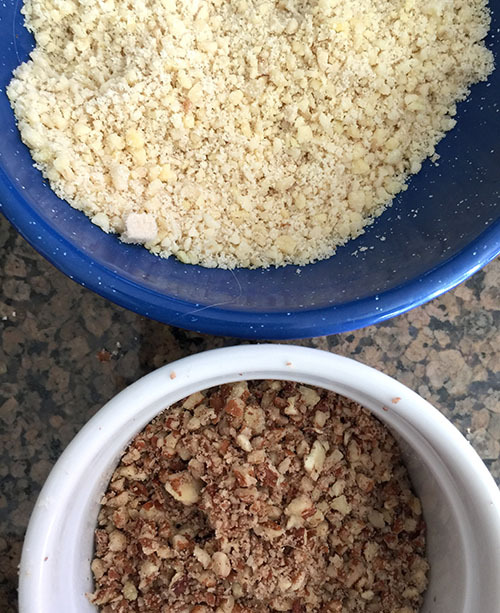 I associate the candy (and other candies, too) with Christmas, and have dabbled in other toffees over the years at holiday time — from a long-cooking (and stirring) English toffee recipe I tried out last year to an earthy version upon which its chocolatey surface was sprinkled finely chopped rosemary and sea salt. So when the Baked Sunday Mornings (see http://bakedsundaymornings.com/about/to learn more about this baking group) recipe schedule in early December listed a Bourbon Chocolate Pecan Pie as the recipe, and I had just made pies for Thanksgiving, and I had candy — specifically toffee — on my mind, my eyes wandered to the Pecan and Almond Chocolate Toffee recipe further down on the list. The recipe will be found on the Baked Sunday Mornings site at a future date, but can be found now in Matt Lewis and Renato Poliafito’s “Baked: New Frontiers in Baking” (2008), a great baking cookbook from which I’ve had the pleasure of making recipes for more than a year with the Baked Sunday Mornings group. This recipe begins like many toffees do — with butter, then sugar and water, which, once combined, are cooked to tawny goldenness and 300 degrees. Here, I’ll make a true confession: despite making toffee a lot, I’m periodically faced with a mysterious (and sad) toffee fail, where the butter seems to separate from the sugar part of the toffee and leaves an oily layer on top of the too-gritty toffee base. It happened once again here, I believe, because I used too large a pan and the toffee cooked too quickly (in research of the matter, I’ve also discovered it could be too much moisture in the butter, stirring the toffee too much, etc.) 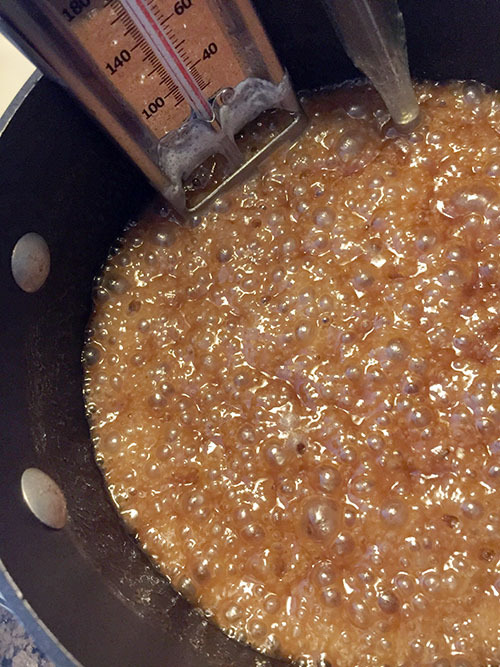 SO, I — complete with ingredients ready for a second go — made the toffee base again, this time with a pinch of salt and a smaller pan. Fate cast a happy light on me the second time, and the toffee seemed to cook properly. 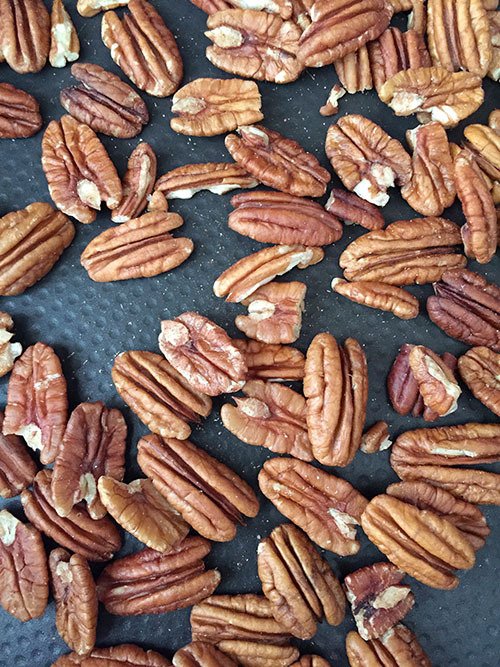 I loved this recipe’s method of mixing in finely chopped pecans before pouring the hot toffee into the pan, sort of like a toffee brittle. 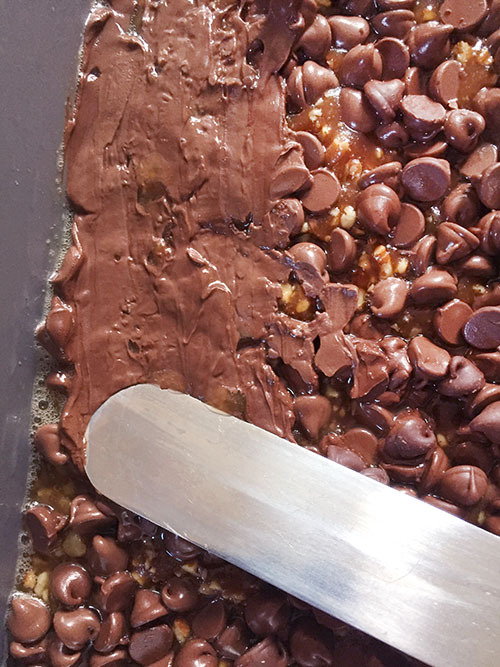 A mix of milk and dark chocolate (great idea, too) is sprinkled over the still-warm toffee, allowed a little melting time and then spread smooth with a pallet knife. 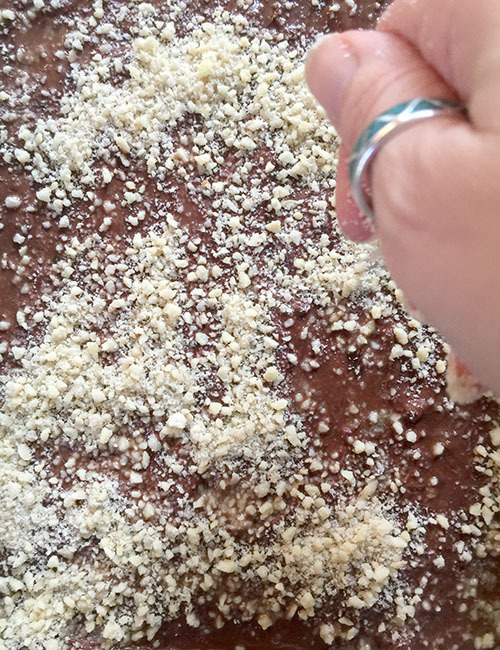 A final dusting of finely chopped almonds over the melted chocolate finishes the toffee-making, then it goes into the freezer to help it all set up. 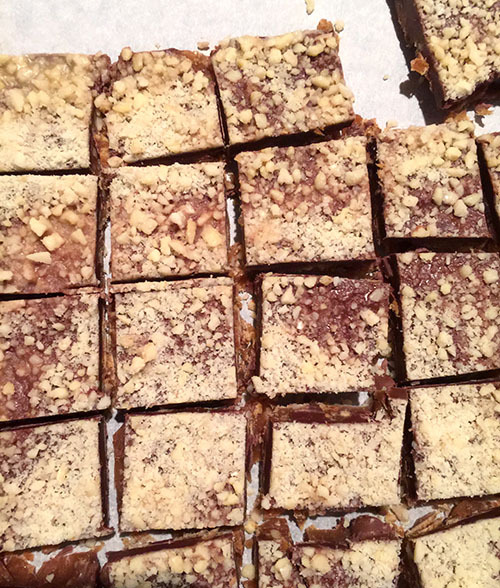 I found this toffee released easily from the pan and cut nicely, too (in some toffee recipes, the candy can only be broken apart into pieces). 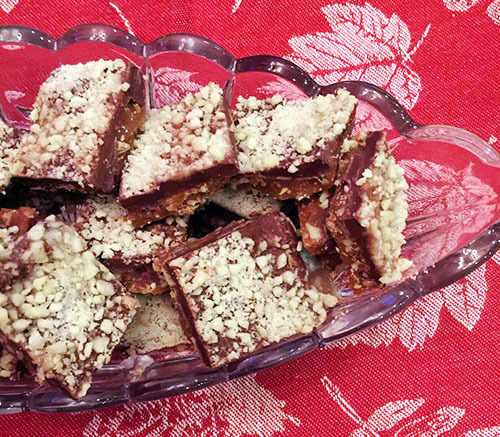 The toffee is beautiful presented in a nice candy dish and would make nice treats, too, in ribboned bags. It is just the perfect thickness to eat, not too dense, with that familiar buttery, nutty snap, cloaked in a melting, rich chocolate top. It’s the kind of candy that you can serve as dessert — with coffee — and no one would be disappointed. It was the first (but won’t be the last) candy I made this holiday season, and I may just have to make more very soon.